Honokohau Beach is a small crescent that boasts some great fish habitat. The water is shallow, and it can get a bit rough. On the path in, there are amazing tide pools and a small wetland! The area is absolutely beautiful, and it takes a small hike from the harbor to make it there. For this reason, it is not recommended for families with small children or anyone who wants to entertain on the beach. (It would be a real hassle to bring a cooler out there!) The beach has no amenities, so please make sure you take out whatever you bring in. This beach allows dogs, hence the local name of “Kona Dog” Beach. Off this Kona snorkeling beach you’ll see needlefish, yellow tailed coris, manini, goatfish, and Moorish idol. You will also have the chance to watch parrotfish, saddleback wrasse, threadfin and multiband butterflyfish, and sea cucumbers! (Did you guys order a salad? I was thinking pizza . . .) Sea turtles definitely pass by Honokohau Beach, so you may share the water with one or two! You’ll want to give these animals 30 feet of space when you can, so they can go about their peaceful day. Mahalo. Get into the water on the left hand side, where it is sandy. The bottom has sand for only a few feet, so you’ll want to float right away. The ocean here can be rough and surgy, like a washing machine, so be careful. For those who are comfortable navigating that kind of water, Honokohau Beach offers a very cool habitat! The sea floor of this Kona snorkeling site is mostly covered with large boulders, smaller stones, and coral rubble. There is hardly anywhere to stand safely. Float over the rocks while you watch the fish. The little sand present is like a swirled ice cream cone – there is both black and white, and all of it is just gorgeous. You needn’t swim far to see the cool stuff – all kinds of species are living right there, just offshore! Do not swim past the breaking waves – it can be easy to get caught out there, and you can be hit by boat traffic from the harbor. When you get out, again on the left hand side of the cove, watch the surge. You probably already know this, but I’ll remind you here: always face the ocean, especially when you are getting into or out of it. That way, you can see what the waves are doing, and act accordingly. This beach has two names: King Kamehameha Beach, and Kamakahonu. The shallow water here is great for lounging, swimming, and – you guessed it! – Kona snorkeling. This family-friendly swimming area is very protected, and the small beach is bordered by walking paths and a lawn. There is an incredible reconstruction of King Kamehameha’s personal heiau (temple), as well. Feel free to approach the edge of the heiau (pronounced “HEY-ow”) and to take pictures, but please show your respect for the site by not touching or walking into it. Mahalo! King Kamehameha Beach is close to many conveniences. Just steps from the sand, you’ll find delicious food and coffee at Menehune Coffee Company, and if you forgot any essentials, no worries – drop by the ABC Store. 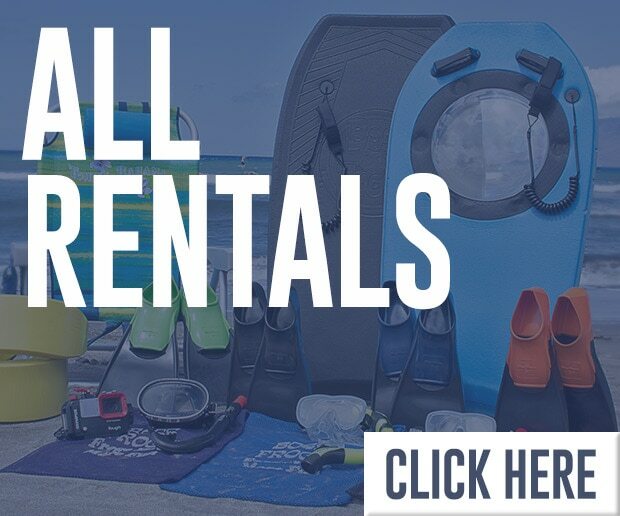 You can even rent kayaks right on the beach from the super friendly folks at Kona Boys! Several fish species swim around and live their lives off King Kamehameha Beach. 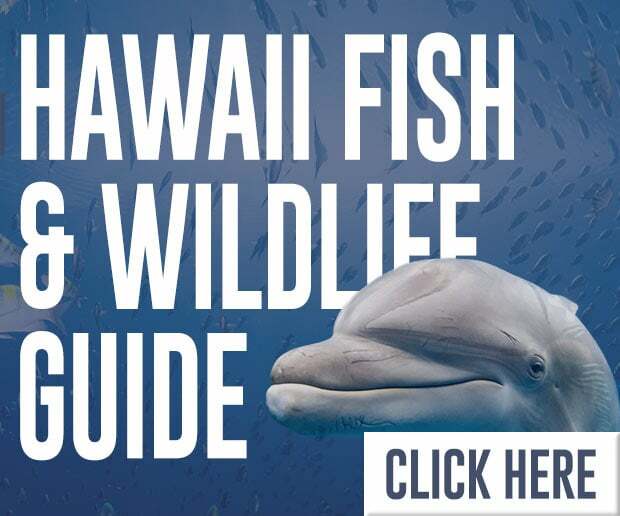 You are sure to share the water with the usual reef suspects such as yellow tang, saddleback wrasse, manini, spotted tobies, and Moorish idol. Fishes at Kamakahonu not seen as often in other Kona snorkeling sites include christmas wrasse and sharpnose mullet. To get into the water at King Kamehameha Beach, just walk in, sit down, and put on your gear. The bottom is sandy at entry, and the water is shallow. Once you leave the sand behind, and swim out a bit, the bottom consists of slate rock and lava stones. Most of the fishes spend time along the edges of the swimming area. Do not swim out past the heiau, as visibility decreases out there, and the fish density does not differ from what you’ll see on the inside. And be sure to never swim in the center of the channel – that area is busy with boat traffic. 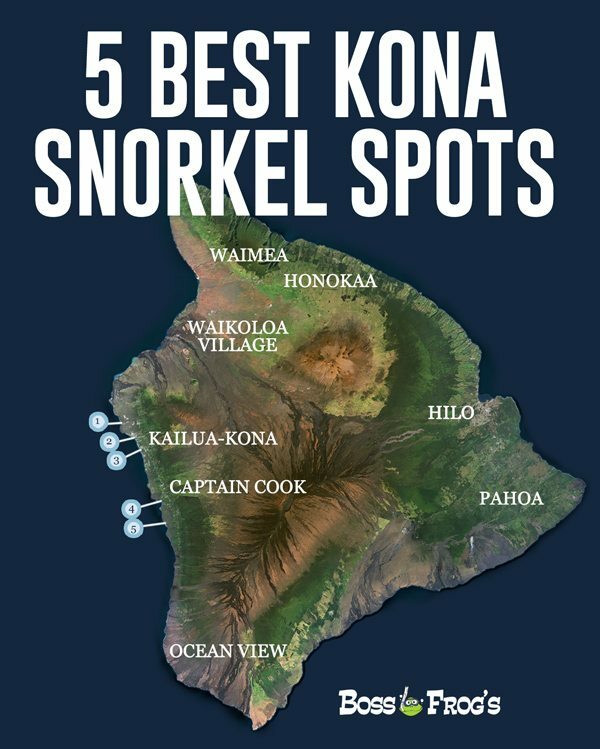 Enjoy your Kona snorkeling here! 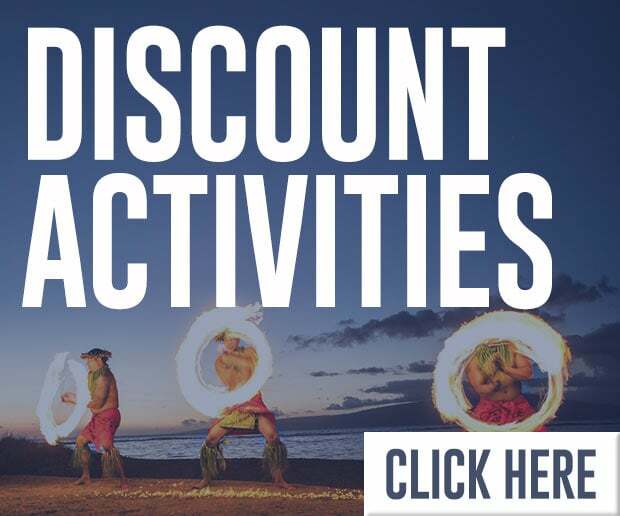 There is so much to explore at Kahalu’u Beach Park! The water is shallow and full of life. 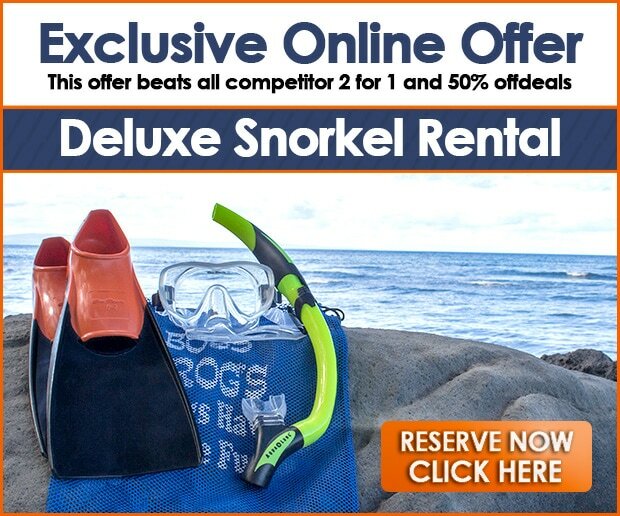 If you are just getting used to your snorkel gear, or you’d like to introduce someone who is new to Kona snorkeling, this is a great spot. Because a fringing reef protects the swimming area, the water tends to be calm. Lifeguards are watching for your safety, and food trucks are available for your belly! Kahalu’u Beach Park is a lot of fun and very busy. There is a shady patch of sand on the left hand side, down the steps, but most of this beach receives full sun. If you want to know about the underwater creatures you see at any Kona snorkeling site, you can pick the brains of the Reef Teachers standing by. Feel free to look at their informational displays, as well! In return for our enjoyment of the reefs, it is our kuleana (responsibility) to care for them, too. Enjoy Kahalu’u Beach Park! Kahalu’u Beach Park hosts an array of multicolored marine life! There are orangeband surgeonfish, yellow tang and yellowtailed coris, green sea turtles, and parrotfish (some species are blue in their male phase). You’ll find sergeant majors, manini, black triggerfish, and several species of butterflyfish, including the lovely lined butterflyfish! There are also rockmover wrasse, manybar goatfish, and Moorish idol, among others. As always, if you see sea turtles at Kahalu’u Beach Park (and flippers crossed that you do! ), make sure to give the swimming reptiles at least 30 feet of space. That way, they can swim and breathe when and where they wish. 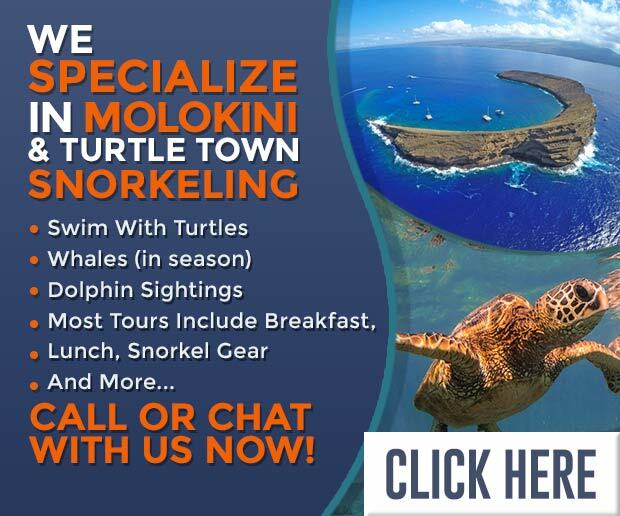 Mahalo for your Kona snorkeling kokua! Before you get to the snorkeling area at Kahalu’u Beach Park, you’ll cross a bit of rough stone lava in shallow water. Do not wear your fins while walking – carry them into the water, and put them on once you’re floating. The habitat here is made up of coarse black sand, slippery rocks, and some coral. The animals depend on their live coral reef and rocky habitat to survive. When people stand on the reef, they are hurting it. Therefore, the only safe place for one to stand is on sand. Unless you’re in trouble, only stand or walk on sand. Now that you know some proper reef etiquette, you can float and swim just about anywhere in this protected area to see incredible fish. This Kona snorkeling site is fairly calm, as an outer reef takes a lot of the energy from waves coming in from the open ocean. Do not swim past the outer reef. 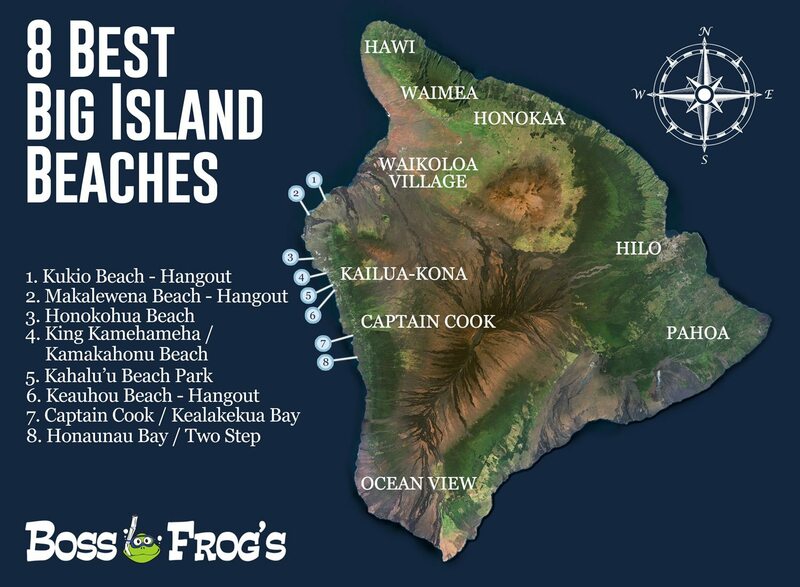 If you’d like to know more about where to swim, talk with the fabulous lifeguards stationed at Kahalu’u Beach Park. If you want to know more about reef etiquette and the life at this beach, talk with one of the many Reef Teachers you’ll see. They all love sharing what they know! 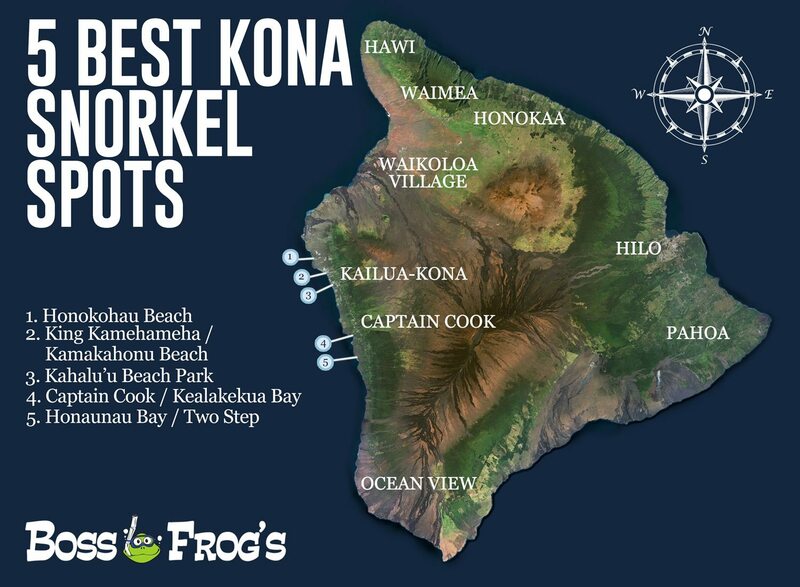 This unmatched Kona snorkeling site, often referred to as “Captain Cook,” is a fantastic marine preserve. The coral reef in Kealakekua Bay is very healthy, and home to large numbers of beautiful fish. There is no beach here, and there are no facilities. 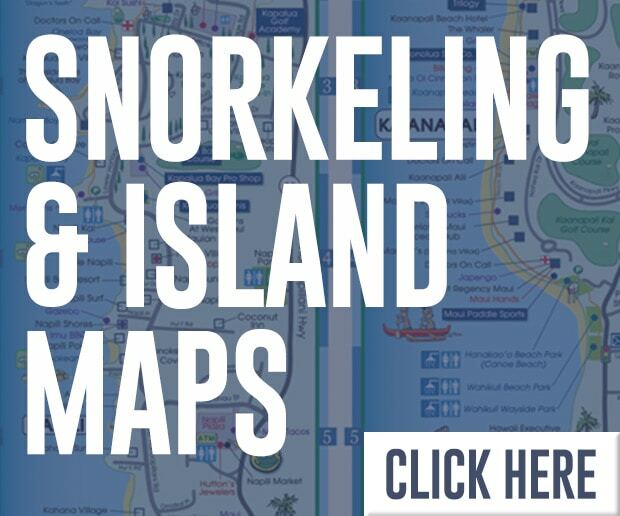 Whether you travel in by boat, paddle in by kayak, or tackle the challenging trail hike down, you will love snorkeling here. 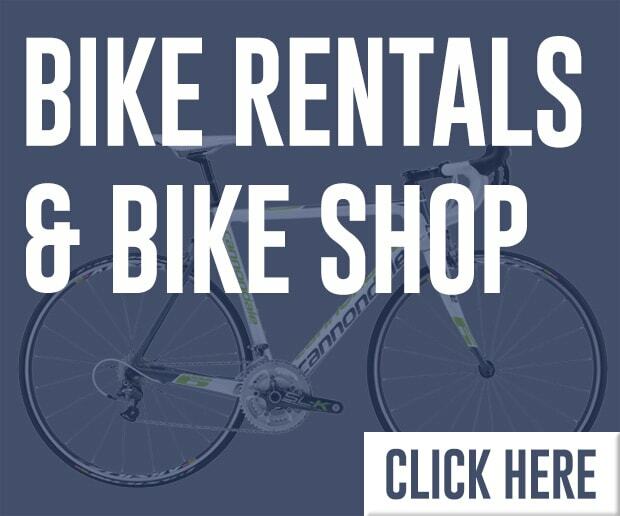 Your mode of transportation will determine whether you can explore the monument to Captain Cook, the ancient Hawaiian temple (heiau), and the woodsy area beyond. All three are located on the shore of Kealakekua Bay. The shoreline – mostly made of dirt, stones, and thorn-dropping kiawe trees – is not a place for relaxing. The views of the mountains surrounding the bay are incredible. A small, crumbling, cement pier juts from shore just in front of the white obelisk of the Captain Cook Monument. Kealakekua translates to “Path to the Gods,”and the fact that Captain Cook chose to drop anchor in this specific spot in 1778 is one of the reasons that the Hawaiians first mistook the British navigator for their god Lono. It is true that Captain Cook was killed here, but that’s not the bay’s only historical claim to fame. A chief named Kamehameha – the nephew of Hawaii Island’s King Kalaniopu’u – met Cook’s midshipman George Vancouver in Kealakekua Bay. The two became fast friends, and together they changed the course of Hawaiian history. 15 years after Cook’s death, Vancouver returned to the Big Island as a captain. He brought sheep, cattle, and the British flag to his friend – now King Kamehameha. Have you ever wondered why the Union Jack is part of the Hawaii state flag? The banner was actually conceived during the War of 1812, in which America and Britain fought with one another. At that point, most of the Hawaiian Islands had been “united” by King Kamehameha in battle. Kamehameha was advised not to take sides in the war, and the flag he created for his kingdom reflects that. The eight red, white, and blue stripes (a nod to the U.S. flag) represent each of the inhabited Hawaiian islands, and Britain’s Union Jack was placed in the upper right corner. If you arrive with a Kona snorkeling tour (by boat), your captain will tell you to get into the water. (It will be easy.) If you hike in, step into the water right from the pier, feet first. The water can be a little shallow there, so when you get in, keep your feet tucked up. Anywhere you explore in Kealakekua Bay is wonderful. The visibility is at least 80 feet. You will find a little sand, but mostly the coral looks as if the reef is a thriving underwater rainforest. There are fish everywhere! Not only is this area difficult to reach, it is also a marine preserve! The water gets deeper as you move closer to the center of the bay, and it also seems to change color to a deeper blue. Because of this, the colorful fish are easier to see along the edges of the bay. When you are finished exploring this Kona snorkeling site (and you may never be, the reef is just so pretty here), climb the thin rope ladder hanging from the cleat on the left hand side of the pier. The Kona snorkeling at Honaunau Bay is magnificent. The actual site is known as “Two Step,” for the two underwater lava steps that you use to get in and out. The coral reef is extensive here, and there are tons of colorful fishes to observe. This bay is right in the middle of Pu’uhonua O Honaunau State Historical Park, which contains several ancient cultural sites. Pu’uhonua translates to “Place of Refuge,” and the region was indeed a sanctuary for any Hawaiian who had been defeated in battle or had broken kapu (sacred law). If you could physically reach the spot, you could stay and live there without retribution. The park is a fascinating, sacred, and generally quiet place. When it comes to Kona snorkeling, Honaunau Bay is not particularly kid friendly, as the amenities are sparse, and there is no beach to speak of. Underwater at Honaunau Bay, you will see loads of beautiful fishes. Brilliantly colored parrotfish flap their pectoral fins – a bit like like birds flap their wings. Parrotfish use their strong beaks to bite bits of coral from the reef. Bright yellow tang come together to form huge, conspicuous schools, while trumpetfish do their best to blend in (sometimes with the schools of tang). All kinds of other fishes flit and float about at this Kona snorkeling site. There is also a very good chance you will see a sea turtle or two! Remember to give them their 30 feet of space. Occasionally, spinner dolphins will visit Honaunau Bay. These dolphins hunt at night. During daylight hours, these intelligent mammals spend most of their day resting. If you are lucky enough to be nearby when a pod is cruising through, let the dolphins decide whether to approach you – do not swim to them. Doing so could be considered harassment, and in the U.S., harassment of marine mammals is against the law. The dolphins will de”fin”itely appreciate your courtesy. Mahalo nui loa! Kona snorkeling at Two Step, as you might imagine, involves a two-step entry! Before you reach the edge, however, you’ll need to pick your way across rough lava rock. If the tide is high, you’ll also walk around tide pools nestled in the rocks. Once you get to the edge, there is are two slimy (and slippery!) rock steps to the left of center. You can use these steps to slide into the water. Here’s another tip to help you get in at Honaunau Bay. When you are ready to get in, wait until a wave is going away from the rocks, and get in at that time. That way, you can more easily push yourself away from shore. Prepare to float right away. Fish, coral and rocks are living right at your entry point, and the sea floor is just 10 feet below you. The south side of the bay – to the left – is more shallow, at about 10 – 25 feet. The north side, on the right, gradually slopes from a depth of 30 – 100 feet, becoming deeper as you swim toward the center of the bay. When you are pau (finished) enjoying this Kona snorkeling bay, use the same steps you used when you got in, and pay attention to the waves as they hit the shore.